The police procedurals Hill Street Blues (1981–’87), NYPD Blue (1993–2005), and Homicide: Life of the Street (1993–’99) combined both methods, telling complete-in-themselves 40- to 45-minute stories while also incorporating a larger “narrative arc” that clamped some or all of the episodes together. And of course even sit-coms depend upon running gags or character quirks, which the viewers were expected to know ahead of time. The Sopranos was the first, however, to use the “arc” as its principle of structure. Or, to say it otherwise, if David Chase had never persuaded HBO officials to introduce Tony Soprano to the American television public, there would never have been the later (and, frankly, better) dramas The Wire (2002-’08) and Deadwood (2004–’06). It has been little remarked upon that the dramatic model behind The Sopranos is the soap opera. For six seasons Chase, Gandolfini, and company struggled against the soap-operish qualities of the Soprano family saga. Will Carmela sleep with Furio? Will Tony and Carmela divorce? Will Christopher make a honest woman of Adriana? Will Meadow and A. J. ever grow up and start acting like adults? It wouldn’t be too wide of the mark, in fact, to describe The Sopranos as a foul-mouthed soap opera with murders—sixty-five of them over the show’s eighty-six episodes. Halperin’s account also has the advantage of explaining the controversial ending of The Sopranos. A smiling and relaxed Tony is meeting his family at a New Jersey diner when the screen abruptly goes black. What has happened is that Tony has been whacked. He never saw the hit coming, never noticed the hitman enter the restaurant and shoot glances at him, never noticed him go to the bathroom just like Michael Corleone in The Godfather as a prelude to a hit. In an amusing effort to review all six seasons in twenty-five epigrammatic nuggets, Edwin Turner wrote a couple of years ago that he views The Sopranos as a “study in existential nihilism”:To put it in the series’ own terms, life is “all a big nothing.” In the series’ final scene in a diner, we’re reminded that the best we can hope for is to enjoy the “good times,” to focus on those moments of peace and happiness with our families. But ultimately, the series suggests nihilism, the “big nothing,” a void signaled in its famous closing shot of extended, abyssal blackness.What Turner overlooks is how neatly Chase, who wrote and directed both the pilot episode and its finale, completes the circle of the show’s six-year run. The Sopranos starts off by borrowing the storytelling device of Portnoy’s Complaint. Tony begins his own “narrative arc” by addressing Dr. Jennifer Melfi in psychotherapy. He tells her about a pair of ducks, “from Canada or someplace,” which took up residence in his pool. They gave birth to ducklings and taught them to fly. “It was amazing,” he says happily. The scene shifts to the interior of his house where his family is having breakfast on his son Anthony Jr.’s thirteenth birthday. Tony comes in, chuffs his son, pats his wife on the backside, picks up an oversized bird encyclopedia. There is nothing to suggest that Tony is anything other than an ordinary family man until scenes of violence and meetings with “associates,” narrated less than candidly to Dr Melfi, identify him as a Mafioso. “Do you feel depressed?” she asks without warning. “Since the ducks left,” Tony confesses. “What is it about those ducks that meant so much to you?” she asks in another session late in the episode. He begins crying. “When the ducks gave birth to those babies,” she points out, “they became a family.” Tony has a moment of insight:You’re right. That’s the link. The connection. I’m afraid I’m going to lose my family like I lost the ducks. That’s what I’m full of dread about. It’s always with me.For eight years it is with him. Finally, though, after all the murders and suicides and attempted suicides, the adultery and the drugs and the meaningless violence, after the longstanding feud with the New York-based Lupertazzi crime organization that claimed so many lives, Tony has his family around him again, intact and healthy. He is listening to Journey’s “Don’t Stop Believing” on the jukebox. And then it ends. Just like that. 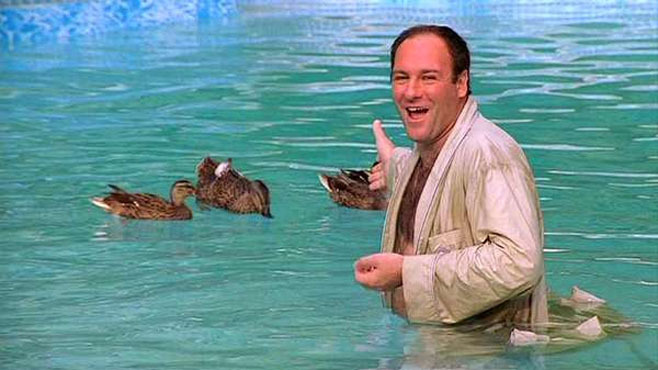 Tony Soprano is not a tragic figure. His death, presumably, is violent, but the violence is not dramatized. A man’s death, as Roman Tsivkin has quipped, does not happen in his lifetime. For the tragic pleasure, though, it must occur in the drama. In the terms of The Sopranos, Tony may be a great man, but his fate and flaw and fall are not what The Sopranos is ultimately about. As trivial as it may sound, The Sopranos is about the completion of its own design. Tony’s dread, enunciated in the first episode, is dissipated in the finale. Tony’s other family, the DiMeo crime organization, has largely been destroyed. Dr Melfi has terminated their therapy, saying, “I don’t think I can help you.” There is nothing more to tell. The “narrative arc” has been closed. He has one moment when he appears to be on the path to something like redemption. Reconciled with Carmela after a nearly year-and-a-half-long separation, he rejects the sexual advances of a drug-addicted commercial realtor who is aroused by the deal they have consummated together. But the moment passes. Tony regrets his self-restraint and returns to his customary ways. The most horrifying moment in the series occurs just one month later, in the fourth-to-last episode, when he murders Christopher Moltisanti, the younger cousin whom he once loved like a son, smothering him after a car accident. Christopher’s death, he tells Dr Melfi, leaves him feeling relieved. There is nothing, in short, to identify with in Tony Soprano. What keeps you watching is the narrative force, the technical expertise of eye-catching storytelling. After a while, though, The Sopranos begins to feel like a dependency, if not an addiction. Like Dr Melfi, you feel a growing uneasiness and hostility toward Tony Soprano. As good a filmmaker as David Chase is, he is unable to turn your moral sense until you begin to pull for the murderer, as you do, say, in Alfred Hitchcock’s Dial M for Murder. The result is a dramatic spectacle. That it isn’t ninety minutes of explosions and fit young men defying gravity by leaping impossible lengths is a cinematic advance, I suppose, when compared to what Hollywood has been bringing to theaters in the years since The Sopranos first debuted. But the appeal is, in its genes, much the same. When the screen goes black in the final episode, you feel neither fear nor pity. Nor do you sit back and contemplate the meaning of existential nihilism. No, you look for something else to watch. Good analysis. Other possibility is that he is not a real-world Mafioso at all (my main evidence for this is that in the real world they, and other sociopaths, are by the laws of God and nature nowhere near as eloquent as many of the Mafiosos in the show), he is a well-spoken former high school football star married to Carmela. He is a union carpenter or school teacher or something who dies in a restaurant, at the moment of death he goes back to his most poetic moment (sympathy for the waterfowl) and guiltily breimagines his life from that point on as an encyclopedia of disgusting violence (the sin of lack of empathy) and unreligioned New Jersey culture. No pre-death call to a relationship with God from Jesus, Italian-American or otherwise, here. Hence the sudden brutal ending and the devastating (for the waterfowl relationship,anyway) beginning. Or else, as you pointed out, it is just one show among many, an incoherent fantasy and the flotsam and jetsam of HBOs appropriation of the available artistic talent to make bankable money. 'The Sopranos' doesn't wear its intelligence on its sleeve: it's character-driven rather than thematic in intent. Themes evolve out of the characters rather than the other way round. To a non-American, the principle theme seems to be the American dream and how it's gone sour. Tony is a criminal and a psychopath. That's the hook. But he's also a small businessman. I'm guessing the latter is the reason why people identify with him - and are meant to identify with him. * I loved 'Homicide: Life on the Streets' and reckon Simon made a conscious attempt to do something as different from it as possible. If 'Homicide' is jazz, then 'The Wire' is a symphony. Each has its own merits. While the cop shows of the '80s advanced their characters' stories over several season, "Soap," a sitcom in the '70s, also did the same thing. My conundrum is that I'm a "Twin Peaks" fan and a Commonplace blog reader, so should I attack myself? I came across this blogpost just today, and I am afraid I disagree strongly with the premise that arc shows are new, or that The Sopranos was the first true one on US TV. 1. Arc shows basically are just a more sophisticated narrative variation of soap operas. They came about when regular show-writers decided they wanted some of that addictive soap opera and telenovela action. 2. Night-time soaps like Dallas far predated The Sopranos. 3. Anime had tons of arc shows for years and years before US TV did, mostly because they were manga/comics adaptations, but partly because the Japanese "dramas" include tons of telenovela-like shows. 4. Mr. Bellisario's mystery and sf shows have consistently included as much arc story as he could reasonably get away with, at time of production. JAG was his first full-blown arc show. 5. Of course Babylon 5 came out years before The Sopranos, had an extremely tight arc despite being viewable in random syndication order, and was much more successful in fulfilling its promises than any US arc show beforehand. J. Michael Straczynski had in fact done his first series, Captain Power, as an arc show. He'd also done the famous "Janine, You've Changed" episode, which cleverly created a sinister arc out of years of unpurposeful character design changes on The Real Ghostbusters cartoon. Anyway... my point was that this sort of thing had been bubbling under the surface for quite a while. The Sopranos was more a well-executed capitalization on an old concept, rather than a totally new thing.